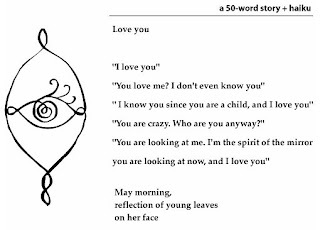 I recently learned that there was a genre of literature called 50-word story. I tried one and added a haiku. In the mornings as I am about to begin to shave the strange man in the bathroom mirror takes a disposable razor in his left hand and places its cutting edge gently but firmly against his soaped neck. Some mornings when the mirror is foggy we wave to each other. very interesting new genre - aside haibun and tanbun. I have to keep an eye on this kind of poetry. I enjoy learning new forms of poetical expression. I agree to Rudi's comment. And I like this work a lot. Just a thought: why not formatting the dialogue without blank lines? It would show three parts clearly: picture, prose and haiku. Sorry, Kuni san, I had to dash away as I was bravely trying to follow your example of making a 50-word story and haiku. And I knew I had a haiku written on a piece of paper but goodnesss...where? At last I have found it. Kuni san, I have now promulgated your 50-word haiku/story challenge on my blog. I think it's an excellent way to stimulate the old grey matter and to overcome occassional writer's block and periodic brain fug and other such obstacles to creativity. I am surprised at the number of comments for my new trial. I am glad you guys are interested.